I have two cards of Ron Blomberg. This one is from 1979 Topps. Playing career: Ron Blomberg was the number one overall pick in the 1967 draft, selected by the Yankees. Unfortunately injuries limited him to just 461 games, 400 for the Yankees and 61 for the White Sox. He hit .293 with 52 HR and 224 RBI for his career. He is best known for being the first designated hitter in the major leagues for the Yankees in 1973, drawing a walk in the first plate appearance for the role. A fuller account of his career can be found at Cardboard Junkie. Where he is now: He is an active public speaker and is involved with many charities, and has his own website. He also runs an annual Ron Blomberg Baseball Camp which he claims is the largest Jewish sleepaway camp in the United States. In 2012 he wrote a book, Designated Hebrew, about the positive and negative experiences of being a Jewish baseball star in the south (where he grew up and played minor league ball) and in New York. It also talks about his experiences managing in the short-lived Israeli Baseball League. My memories: He is before my time, but you always hear about him whenever the topic of the designated hitter is brought up. Google Autocomplete results: He is first when you type Ron Bl, ahead of Ron Blank, a continuing education company. There do not appear to be any other prominent Ron Blombergs. Coming up next: The next profile will be Ben Blomdahl. I have five cards of Terry Blocker. This one is from 1989 Score. Playing career: Terry Blocker played in 110 games for the Mets and Braves, hitting .205 with 2 HR and 11 RBI. Blog synchronicity: This is the blog's 1982nd post. In 1982 Blocker played at AA Jackson, hitting .260 with 5 HR, 38 RBI and 40 SB. Interesting facts: As a replacement player for the Braves in spring training 1995, Blocker befriended pitcher Dave Shotkoski. When Shotkoski was murdered one night in a robbery near the team’s hotel in West Palm Beach, Blocker used some contacts he had made when playing there in the minor leagues several years earlier to identify Shotkoski’s killer, helping police arrest him. Blocker gave his reward money to Shotkoski’s widow. Where he is now: Anyone know where Terry Blocker is now? Google Autocomplete results: He is fifth when you type Terry Blo, between Terry Blount Twitter, referring to an ESPN NFL reporter, and Terry Bloom, a journalism professor at the University of Miami. There do not appear to be any other prominent Terry Blockers. Coming up next: The next profile will be Ron Blomberg. I have four cards of Bill Bliss. This one is from 1992 Classic Best. 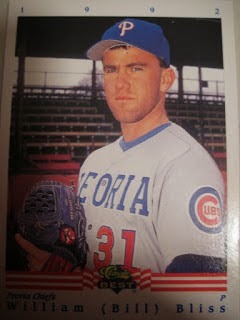 Playing career: Bill Bliss pitched in the Cubs and Rockies organizations from 1991 to 1995. In 122 games he went 13-16 with 15 saves and a 4.55 ERA. Where he is now: Works for the MLB Players Alumni Association. Google Autocomplete results: He is first when you type Bill Bli, ahead of Bill Clinton, the former President. The first entry when you google Bill Bliss is not the ballplayer but a manager at Microsoft. Coming up next: The next profile will be Terry Blocker. 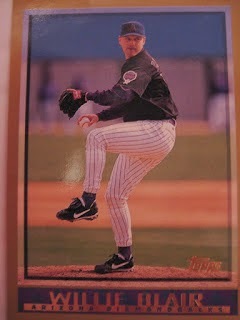 I have one card of Jeremy Blevins, from 2000 Royal Rookies. Playing career: Jeremy Blevins pitched eight seasons in the Angels and Yankees organizations. In 208 games he went 36-36 with a 4.06 ERA. Interesting facts:There is a pitcher for the Nationals named Jerry Blevins. He usually gets a couple of Jeremy Blevins cards a year from autograph-seeking fans who confuse the two. He keeps the cards in his locker. Where he is now: A millhand at Fluor Daniel. Google Autocomplete results: He is eighth when you type Jeremy Ble, between Jeremy Bleich MILB, referring to the Yankees prospect, and Jeremy Bleeker, President of Eastern Iowa Construction. Another prominent Jeremy Blevins was a runner who died of oral cancer last year. Coming up next: The next profile will be Bill Bliss. I have one card of Jeremy Bleich, from 2008 Razor. Playing career: Jeremy Bleich was the Yankees’ first-round draft pick in 2008, and had a pretty good start to his minor-league career before missing all of 2011 and most of 2012 to injury. In 2013 he pitched well out of the bullpen for AA Trenton, going 2-1 with a 2.76 ERA in 27 games. Where he is now: After racking up a 3.51 ERA in twelve starts in AA Trenton, he was promoted to AAA Sranton, where he has struggled mightily in his first three starts, going 0-2 with an 8.59 ERA. Google Autocomplete results: He is third when you type Jeremy Bl, between Jeremy Blake, an artist, and Jeremy Blum, a software engineer. Another prominent Jeremy Bleich is an electric bassist. Coming up next: The next profile will be Jeremy Blevins. I have four cards of Ron Blazier. This one is from 1993 Classic Best. Playing career: Ron Blazier pitched for the Phillies in 2006 and 2007. In 63 games, all in relief, he went 4-2 with a 5.38 ERA. Where he is now: A Production Worker at Philadelphia Gas Works. Google Autocomplete results: He is first when you type Ron Blaz, ahead of Ron Blaze, a Logistics Manager at Home Depot. There do not appear to be any other prominent Ron Blaziers. Coming up next: The next profile will be Jeremy Bleich. I have 73 cards of Jeff Blauser. This one is from 1995 Collectors Choice. Playing career: Jeff Blauser was the shortstop of the great Braves teams of the early and mid-1990s. He also played for the Cubs in 1998 and 1999. In 1,407 games he hit .262 with 122 HR and 513 RBI. He was the regular shortstop for the 1995 World Champion team but did not play in the World Series due to a thigh bruise. Interesting facts: In spring training of 1989 the Yankees and Braves discussed trading Jeff Blauser for prospect Bernie Williams. Bobby Cox, then Braves GM, declined, saying “Bernie was it a while ago, but he’s a couple of years off. Blauser is ready right now." Google Autocomplete results: He is sixth when you type Jeff Bl, between Jeff Blake, the former Bengals quarterback, and Jeff Black, a country singer. There do not appear to be any other prominent Jeff Blausers. Coming up next: The next profile will be Ron Blazier. I have one card of Tony Blasucci, from 1990 CMC. Playing career: Tony Blasucci was the Pirates’ number one draft choice in 1983, but after three years of struggles as a starter was released. He was picked up by the White Sox for whom he saw success in the bullpen, moving more steadily through their system. Though he never reached the major leagues, he did spend part of three seasons at AAA in the White Sox’ and Mariners’ systems. A full account of his career can be found in a three part interview from The Greatest 21 Days in 2012. Post-playing career: After his retirement from baseball he worked in sales for various companies and was also a youth baseball instructor, including working closely with his son Nick. He died in May 2014 due to injuries sustained in a boating accident. A fund has been set up for Nick to continue his baseball dream – details can be found in Blasucci’s obituary. Google Autocomplete results: He is fourth when you type Tony Blas, between Tony Blasi, a Managing Director at Credit Suisse, and Tony Blasco, a doctor in Quakertown, PA. There do not appear to be any other prominent Tony Blasuccis. Coming up next: The next profile will be Jeff Blauser. I have one card of Chadd Blasko, from 2005 Topps. Playing career: Chadd Blasko was the Cubs’ number one draft choice in 2002 and got off to a fast start to his career in 2003, going 10-5 with a 1.98 ERA for Class-A Daytona. Unfortunately, injuries limited him to just 30 more games after that and he was out of baseball for good after 2007. Where he is now: A PE/Health teacher at John J. Young Middle School in Mishawaka, IN. Google Autocomplete results: He is third when you type Chadd B, between Chadd Bridwell, Associate VP of Enrollment at Texas Western University, and Chadd Blog, referring to an Attention Deficit Disorder blog. There do not appear to be any other prominent Chadd Blaskos. Coming up next: The next profile will be Tony Blasucci. 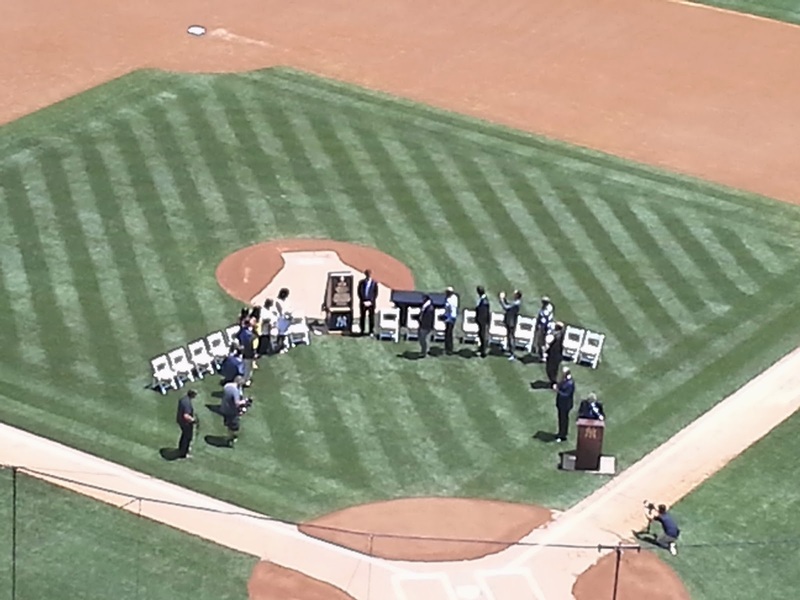 Today I went to Yankee Stadium and saw a nice celebration of Tino Martinez's Yankee career, capped off with him getting a plaque in Monument Park. Among the former Yankees who came to the ceremony were David Cone, Paul O'Neill, Jorge Posada, Joe Torre and Mariano Rivera. It was cool to see a "Day" for a former player, particularly one whose career I enjoyed. They also showed a retrospective of career highlights for Tino, including the home run he hit at Shea Stadium in the Yankees' first-ever regular season series there in 1998. (Can't believe that is now sixteen years ago!) It was the Saturday afternoon game of the weekend series and I was there for that one live, so it was cool to see it in the video. The picture from this card also comes from that game. As for the game that followed, I pretty much new what to expect with Vidal Nuno pitching, so a 6-1 loss was no surprise. It was nice to see Mark Teixeira, Tino's modern-day counterpart, hit a home run. I have two cards of Jabari Blash. This one is from 2012 Bowman Platinum Prospects. Playing career: Outfielder Jabari Blash was the Mariners’ eighth round draft pick in 2010, and has quickly moved through their system, showing impressive power. In five seasons he is hitting .255 with 76 HR and 257 RBI. Where he is now: He is having an excellent first AAA season power-wise at Tacoma, including a three home run game against El Paso on June 3. In 44 games he is hitting .212 but with 12 HR and 37 RBI. Google Autocomplete results: He is third when you type Jabari B, between Jabari Bird, who plays basketball at the University of California, and Jabari Bars, a dessert made by NBA prospect Jabari Parker. There do not appear to be any other prominent Jabari Blashes. Coming up next: The next profile will be Chadd Blasko. I have eight cards of Joe Blanton. This one is from 2007 Topps. Playing career: Joe Blanton had a ten-season major league career, winning 85 games for the A’s, Phillies, Dodgers and Angels. In 2008 he helped the Phillies win the World Series by going 4-0 for them after being acquired in a mid-season deal with Oakland. In the World Series that year he won Game 4, in the process becoming the first pitcher since 1974 to hit a World Series home run. My memories: I remember him as the “other guy” on those big Phillies staffs with Halladay, Lee and Hamels. He probably didn’t get the respect he deserved for a pretty good major league career. Where he is now: After two games with the A’s AAA team he retired this April. Google Autocomplete results: He is first when you type Joe Bl, ahead of Joe Black, the former Dodgers pitcher. Another prominent Joe Blanton is the former President of Publix. Coming up next: The next profile will be Jabari Blash. I have three cards of Larvell Blanks. This one is from 1979 Topps. Playing career: Infielder Larvell “Sugar Bear” Blanks (the nickname supposedly came from a popular song when he was in the minor leagues) was a decent hitting but poor-fielding infielder for some bad Braves, Indians and Rangers teams in the 1970s, an era when teams usually carried infielders who were good fielders but poor bats. Blanks was often frustrated about lack of playing time, especially when Frank Robinson was his manager in Cleveland (though a widely circulated story that Blanks burned his uniform in the Indians’ clubhouse is likely apocryphal). A fuller account of his career can be found at the 1975, 1976 and 1977 Topps blogs. Blog synchronicity: This is this blog's 1971st post. In 1971 Blanks played at AA Savannah, hitting .222 with 14 HR and 48 RBI. Where he is now: He is a longtime youth baseball and tennis instructor who is currently focused on golf. In 2010 he played on the Golf Channel Amateur Tour, winning four tournaments. He is now a part of the Individual Golf Tour. On Saturday he didn't have a great tournament, finishing 25th at The Wilderness, but a week earlier he won the tournament at Colo Vista, earning a $725 payday. Interesting facts: His uncle Sid Blanks was an All-Pro running back for the Houston Oilers. Sid’s son Lance Blanks, Larvell’s cousin, played in the NBA and is now the General Manager of the Phoenix Suns. Google Autocomplete results: He is third when you type Larvel, between Larvelle Jones and Larvell Jones Nickname, both of which refer to Michael Winslow’s “Motor Mouth” character in Police Academy. There do not appear to be any other prominent Larvell Blankses. Coming up next: The next profile will be Joe Blanton. I have two cards of Kyle Blanks. This one is from 2010 Topps Opening Day. Playing career: Outfielder-first baseman Kyle Blanks came up with the Padres in 2009 and has played part of every season with them since, but injuries have limited him to just 254 games over those five years, in which he has hit .228 with 28 HR and 98 RBI. Where he is now: After playing five games for the Padres in 2014, he was traded to Oakland, where he has been off to a good start, hitting .317 with 2 HR and 7 RBI in his first 18 games with the A's. Yesterday he was 0-for-2 with a walk and a run scored in a loss to Texas. Google Autocomplete results: He is second when you type Kyle Bl, between Kyle Blackmon, a Manhattan realtor, and Kyle Blaha, a doctoral student at Juilliard. There do not appear to be any other prominent Kyle Blankses. Coming up next: The next profile will be Larvell Blanks. I have 35 cards of Lance Blankenship. This one is from 1989 ProCards. Playing career: Lance Blankenship was a backup infielder for the Oakland A’s from 1988 to 1993, playing for three pennant winners and one World Champion. In 461 games he hit .222 with 9 HR and 92 RBI. Where he is now: Owns Blankenship Baseball in Danville, CA. Google Autocomplete results: He is fourth when you type Lance Bl, between Lance Blair, a voice-over actor, and Lance Blake Architect, referring to an architect in New York. Another prominent Lance Blankenship is an attorney in San Antonio. Coming up next: The next profile will be Kyle Blanks. I have nine cards of Kevin Blankenship. This one is from 1989 ProCards. Playing career: Kevin Blankenship pitched nine seasons of professional baseball, going 70-62 with a 3.66 ERA. He pitched in eight major league games between 1988 and 1990 with the Braves and Cubs. Where he is now: Owns Re-Nu Refinishing in Sacramento, CA and does some youth pitching instruction. Google Autocomplete results: He is seventh when you type Kevin Blan, between Kevin Blanchette HBO, referring to a marketing director, and Kevin Blanchard, an offensive lineman at Penn State. Another prominent Kevin Blankenship is a psychology professor at Iowa State. Coming up next: The next profile will be Lance Blankenship. I have one card of Bob Blankenship, from 1989 ProCards. Playing career: Bob Blankenship pitched for two seasons in the Reds organization. In his second season, at Class-A Bend, he went 2-4 with 12 saves and a 1.36 ERA in 27 games, but never pitched again. I assume injury but couldn’t find anything online to confirm. Where he is now: Does youth baseball coaching in California. Google Autocomplete results: He is seventh when you type Bob Blan, between Bob Bland Brooklyn Royalty, referring to a fashion designer, and Bob Blanton, an athletic trainer in Virginia. There are no references to the ballplayer on the first page of Google results; the first entry is for a chemistry professor at Washington University. Coming up next: The next profile will be Kevin Blankenship. I have five cards of Matt Blank. This one is from 2000 Bowman. Playing career: Matt Blank pitched nine seasons of professional baseball, mostly in the Expos system. He made the major leagues with the Expos in 2000 and 2001, going 2-3 with a 5.11 ERA in eighteen games. Where he is now: Senior Account Executive at TLC Office Systems in Houston. Google Autocomplete results: He is fourth when you type Matt Bl, between Matt Blatt, a Kia dealership in New Jersey, and Matt Blackstone, an author. The first entry when you google Matt Blank is not the ballplayer but the CEO of Showtime Networks. Coming up next: The next profile will be Bob Blankenship. I have six cards of Henry Blanco. This one is from 2007 Upper Deck. Playing career: Henry Blanco played sixteen years in the major leagues as a backup catcher for eleven different teams. He spent four years with the Cubs, twice as many as with any other team. The only times he appeared in over 100 games were with the Brewers in 2001 and Twins in 2004. A very good defensive catcher, in 971 games he hit .223 with 72 HR and 298 RBI. Where he is now: Assistant hitting coach for the Arizona Diamondbacks. Interesting facts: His brother Carlos Blanco was killed in a kidnapping in 2008 while Henry was negotiating with the kidnappers. Google Autocomplete results: He is second when you type Henry Bl, between Henry Blodget, CEO of Business Insider, and Henry Blackaby, founder of Blackaby Ministries International. There do not appear to be any other prominent Henry Blancos. Coming up next: The next profile will be Matt Blank. I have three cards of Gregor Blanco. This one is from 2008 Stadium Club First Day. Playing career: Outfielder Gregor Blanco came up with the Braves in 2008, and also played briefly for the Royals before becoming a regular outfielder on the Giants in their 2012 World Championship year. Though he did not have a great regular season, hitting just .244 with 5 HR and 34 RBI, he had a great postseason, with five extra-base hits and a couple of great World Series defensive plays. Where he is now: This year in 51 games for the Giants, he is hitting .242 with 0 HR and 13 RBI. Yesterday he was 0-4 in a loss to Washington. Interesting facts: He has his own blog at MLB.com, where among other things he describes being kidnapped in his native Venezuela at the age of 16. Google Autocomplete results: He is tenth when you type Gregor , after Gregor Gracie, an MMA fighter. There do not appear to be any other prominent Gregor Blancos. Coming up next: The next profile will be Henry Blanco. I have one card of Andres Blanco, from 2006 Upper Deck. Playing career: Infielder Andres Blanco played for the Royals, Cubs and Rangers from 2004 to 2011. In 235 games he hit .255 with 3 HR and 47 RBI. Where he is now: This year he is playing for the Phillies' AAA team in Lehigh Valley. In 28 games he is hitting .250 with 0 HR and 9 RBI. Google Autocomplete results: He is second when you type Andres Bl, between Andres Blank and Andres Blank Caliber, both of which refer to a social media company founder. Another prominent Andres Blanco is an economics PHD candidate at NYU. Coming up next: The next profile will be Gregor Blanco. I have 26 cards of Hank Blalock. This one is from 2006 Upper Deck. Playing career: Third baseman Hank Blalock exploded onto the scene with the Rangers in his first two full major league seasons, hitting around .300 with around 30 HR and 100 RBIs both years. Unfortunately injuries (including at one point losing a rib) quickly sapped him of his power and he was out of baseball after 2010. Overall in 936 games he hit .269 with 153 HR and 542 RBI. My memories: He sure seemed like he would be one of the game’s big stars. It is surprising how quickly his career fell off. Where he is now: Anyone know where Hank Blalock is now? Google Autocomplete results: He is eighth when you type Hank B, between Hank Brewers, referring to the team’s mascot, and Hank Baskett Job, referring to the former NFL wide receiver. There do not appear to be any other prominent Hank Blalocks. Coming up next: The next profile will be Andres Blanco. I have twelve cards of Casey Blake. This one is from 2010 Topps. Playing career: Third baseman Casey Blake played thirteen years in the major leagues, mostly with the Indians and Dodgers. In 1,265 games he hit .264 with 167 HR and 616 RBI. Between 2003 and 2010 he hit at least 17 home runs a year. My memories: Although he spent more time with the Indians and Dodgers, for some reason I remembered him only as a Dodger and completely forget he was an Indian. That is the power of playing for a big-market team, I guess. Where he is now: Owns the Casey Blake Baseball Camp in Indianola, IA. Google Autocomplete results: He is fourth when you type Casey B, between Casey Brooks, a fashion photographer, and Casey Biggs, an actor. Another prominent Casey Blake is a Columbia history professor. Coming up next: The next profile will be Hank Blalock. Australian infielder Trent Durrington played parts of five seasons in the major leagues with the Angels and the Brewers. In 140 games he hit .196 with 2 HR and 9 RBI. Now a Project Manager for Australasian Homes in Queensland, he kindly shared with me this baseball card-related story. "My first trip to America I had Nolan Ryan sign a Astros card! I will email you a copy! I was about 16 and it was the day he got in a fight with Ventura at Texas." Bill Laskey pitched six seasons in the major leagues, twice winning thirteen games as the ace of the Giants' staff in 1982 and 1983. He now is the president of sports talent agency Celebrity Connection, owner of the SF Giants Fantasy Camp, and is a Giants analyst on Comcast Sportsnet. He kindly answered my questions on baseball cards. "Really no story about baseball card experiences, except the thrill of getting my very first one!!" Second baseman Adam Kennedy played fourteen seasons in the major leagues. His best year was 2002, when he helped the Angels win the World Series, hitting .312 with 7 HR and 52 RBI in the regular season. In the ALCS he hit three home runs in Game 5, helping him win the MVP award for that series. Now the owner of Adam Kennedy Baseball in Los Angeles, he kindly answered my questions about baseball cards. "I don't collect cards anymore. Growing up I absolutely did. Daryl Strawberry Topps rookie was my favorite. I think there's a card with my picture and Eckstein's name or vice versa." Thanks! Here is the card with Kennedy's picture and Eckstein's name. 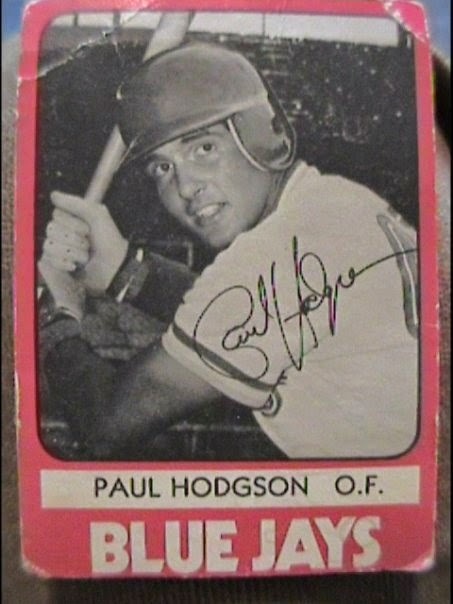 Outfielder Paul Hodgson was signed by the Blue Jays as a seventeen-year-old in 1977 and played seven seasons in their system. 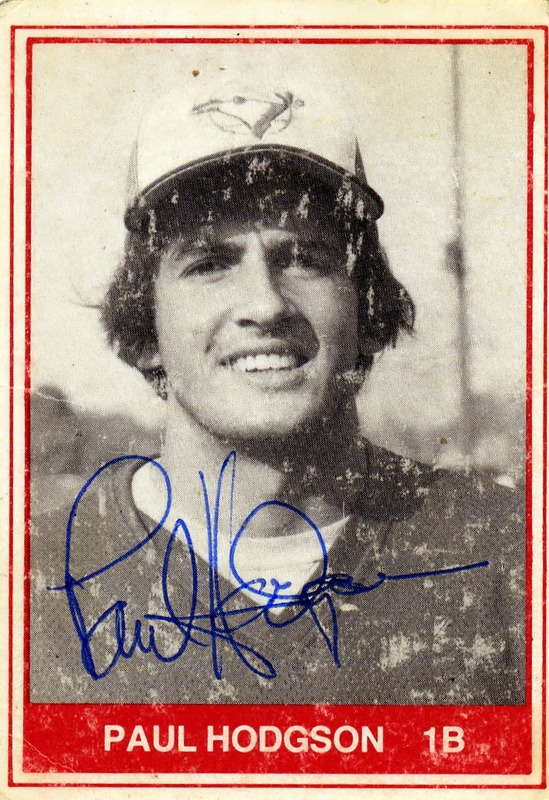 In 1980 he became the second Canadian to play for the Blue Jays, hitting .220 with 1 HR and 5 RBI in 20 games. He kindly answered my questions about baseball cards. When I started playing pro ball, I wasn't old enough to be on a baseball card. My dad had to sign a waiver. I got the waiver from Topps (or who ever it was) but it totally slipped my mind, never gave it to him. Found the waiver, unsigned, a couple years back, among bits of memorabilia from back in the day. 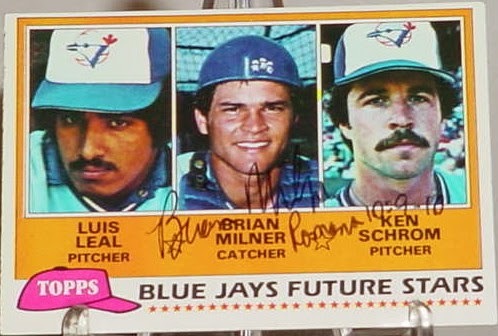 It was different then anyway, usually put 3 or 4 rookies on a card, as with the one attached from our team in '81. I wasn't much of a collector, but dad ran a general store, so I did get the packs and enjoyed reading about the players and getting the gum. I was an Oakland fan as a kid, so I tried to get Oakland players. My favorite players were Reggie Jackson and Bobby Bonds, so I would've enjoyed those cards or any from their teams, for sure . - Do you collect baseball cards ? I don't collect cards, never really would have called myself a collector, even in the early days. Most pro baseball players start out as fans, but after being around the game as a career, after a few years we lose the "fan" in us and it usually never returns. Sad, but true. I've never met any of the guys after our playing days who collected anything, or even paid much attention to MLB (unless, of course, they were be coaches or scouts. That's different). Would say 99% of us would have liked to spend our lives in the game, but sadly, the game doesn't work out that way for almost all of us. Thanks! He also attached pictures of his black and white cards from the Southern League in 1981 and 1982. I have 33 cards of Willie Blair. 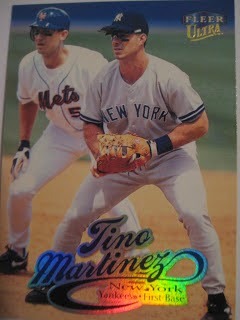 This one is from 1998 Topps. Playing career: Willie Blair pitched twelve seasons in the major leagues for eight different teams. His best season was 1997 when he went 16-8 for Detroit. Overall, in 418 games he went 60-86 with a 5.04 ERA. Where he is now: Bullpen coach for the San Diego Padres. My memories: In 2012 he shared his thoughts on baseball cards with this blog. Google Autocomplete results: He is third when you type Willie Bl, between Willie Black, referring to a character in the movie Gridiron Gang, and Willie Blige, Commuter Tech at the NYC Department of Education. Another prominent Willie Blair is a surgeon in Maryland. Coming up next: The next profile will be Casey Blake. Bruce Tanner pitched seven seasons of professional baseball, going 38-38 with a 3.20 ERA. He made the major leagues in 1985, pitching in ten games for the White Sox. Now a scout for the Tigers, he kindly answered my questions about baseball cards. "I used to collect cards but it became overwhelming and time-consuming. No particular cards that I have are favorites." At least twice I went to Yankee games when Phil Hughes was pitching and he got belted around as the Yankees lost. Today I went to the game, and the opposing pitcher for the Twins was none other than Phil Hughes. I was hoping he would continue to be the batting-practice style pitcher he used to be for the Yankees. 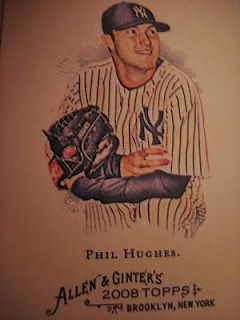 Instead he pitched a near-no-hitter against the Yankees' anemic offense (the Yankees' three hits to lead off the fourth were their only ones of the game) and David Robertson pitched like the Hughes of old to take the shine off what was otherwise a fun day at Yankee Stadium.